Mapping the shape of our galaxy poses quite a challenge. We are located about two-thirds of the way from the center within the galaxy itself, and there is often dust and gas blocking our view. To get a really good idea of the shape of our galaxy, you need to make observations at various wavelengths, because each wavelength can give a different view. One of the debates about the shape of our galaxy has been about the number of spiral arms it has. It’s generally been thought that there are four, but when the Spitzer space telescope did an infrared survey of our galaxy it found only two spiral arms. 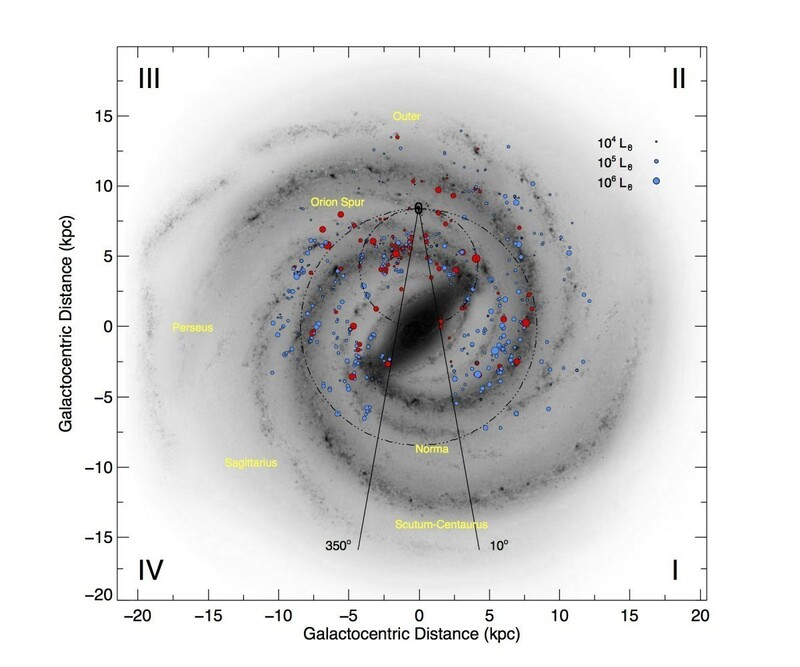 But new data from the Midcourse Space Experiment (MDX) has found there are in fact four spiral arms. The results were reported in the Monthly Notices of the Royal Astronomical Society (the arxiv version is here). MDX also looks at infrared wavelengths, but at a region closer to the visible spectrum. So while Spitzer could see smaller stars, MDX looked at young large stars. The team analyzed data from MDX to identify nearly 1800 young massive stars. Since these type of stars tend to form within spiral arms, mapping their locations gives us an idea of the locations of spiral arms. The results can be seen in the image below (from the paper). The blue dots show the location of individual stars, while the red dots show the location of stellar complexes, where several stars are forming. You can see that the stars tend to group along four spiral paths. Data analysis of these stars confirm that there are four spiral arms. So it seems we were right after all, and our galaxy does have four spiral arms.